Sake Factory Museum in Nada, Kobe. A couple years ago I wrote a post about sake. In that time I have had the opportunity to visit both Nada and Saijo where I learned even more about sake. Sake, like wine, takes years to understand and requires a lot of tastings to taste the subtle differences. The setting where you try the sake is also important. After talking to various people, both students as well as employees at various sake breweries, I have learned a lot in the past year or so. I can easily say I now understand sake but I’m still no expert when it comes to telling the real differences. Like any alcohol, you have to taste it and buy what you like. If one type is what you enjoy the most, by all means enjoy it. If you don’t like it, don’t drink it. There are many ways to give sake a try and I still think that John Gauntner’s website Sake World is the best basic introduction to sake. His website provides a lot of information but for a humble beginner, looking at the Types of Sake page will help a lot and I did compile a lot of information from his page. If you want to learn a little more, I also recommend the manga “Oishinbo”. In English, there is a sake book where they go over various food pairings as well as whether sake should be hot, cold, or otherwise. While these sources did help me understand sake, I did come to my own conclusions from discussing sake with various students and other people at the various sake factories that I visited over the last year or so. In my previous post, I mentioned the 4 types of sake. What I failed to mention was that these 4 types actually end up being 6. Honjozo is the most basic sake. It is sake that has alcohol added to enhance the aromas and flavours. It is what I would consider the lowest class of sake, but it doesn’t make it bad sake. It can be akin to drinking a basic lager or a table wine. It is a good base from which to compare other types of sake, but it is not the best one to start with as it is one of the strongest in flavour. The next level up would be the Junmai sake. This is similar to Honjozo with the exception that alcohol is not added. It tends to be a bit softer as there is no alcohol added, but it can also be a bit drier at the same time. It really depends on the brewers and their techniques. 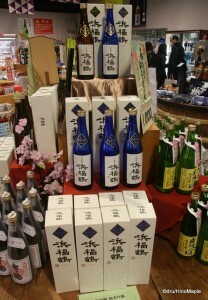 From here, sake is classified into either “regular” or “junmai” where junmai basically denotes sake made with only rice. Like the differences between Honjozo and Junmai sake, the differences between “regular” and “junmai” sake tend to be that “junmai” has a softer taste. Moving up a level, Ginjo is the mid-level sake that uses older techniques to make the sake. 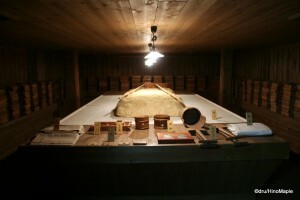 As the quality of sake is increased, the amount of milling or polishing of the rice also increases. In the simplest sense, it makes the sake softer and sweeter. Also note that a Junmai-Ginjo is by nature a bit lighter than a Ginjo due to the absence of added alcohol. The highest level of sake is the Daiginjo, or “big” Ginjo. It has the highest level of polish and is also split into the regular Daiginjo and the Junmai-Daiginjo. Junmai-Daiginjo is my favourite as it has the softest flavours. It is what I would recommend when drinking just sake. In terms of food pairings, if you are enjoying seafood or a light meal, Daiginjo is the best as it is the sweetest. It can be similar to white wine in terms of food pairings. As you move down the list of sake, you can add stronger flavours until you reach the opposite end, Honjozo. Honjozo is better paired with heavy foods such as red meat or deep fried foods. While this is generally true, it is important to realize that sake cannot be shoehorned into specific groups. Each brewery has its own technique which leads to each brewery creating very different flavours within the same group of sake. In Canada, and by proxy America, the drink sake conjures up the image of a hot alcoholic drink. 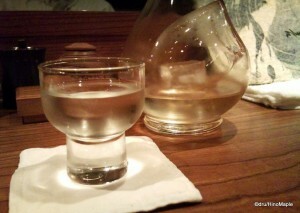 Honjozo is also the most popular sake to be heated. Due to the lower levels of polish and the added alcohol, Honjozo can stand up to the heat and still retain its flavours. Some will say that a good warm Honjozo is actually more delicious than a cold Honjozo. At the Ginjo level, you can imagine it would taste better closer to room temperature. The only way to truly know the best way to drink the sake is to ask the brewery itself. If you have a chance to visit a brewery, they will almost always tell you the best way to enjoy their different sake. When drinking a Daiginjo, it is almost unheard of to heat it in order to enjoy it. I would never heat up good sake. If you are experimenting, there is no harm in trying any sake that has been heated, left at room temperature, or chilled. It is important to discover your own personal favourite and then experiment with temperature until you find the one that satisfies you. How you drink sake can be just as important as the temperature at which you enjoy sake. There are several cups from which you can enjoy sake with the choko being the most common cup to enjoy sake. It is a small round cup that is similar to a short, fat shot glass. It is important to note that while a choko is the most common way to drink sake, it is not the most common style to drink it in Japan. Many people will use a standard or a double sized shot glass as it is easier to buy a basic shot glass. 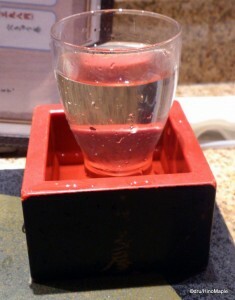 In restaurants, these shot glasses are often places inside a masu, a wooden box. A traditional masu is made out of wood such as hinoki that has a nice fragrance. Most restaurants will not use traditional wood. Instead they will replace the wood with a simple plastic masu, although very high end restaurants may use wood masu that has been lacquered. When having a glass with a masu, it is common to fill the glass with sake and depending on the shop, they will either overflow the glass a little or a lot and the masu will have some sake in it as well. Sometimes they replace the masu with a sakazuki, or a flat dish used for sake. The sakazuki is more commonly used in shrines for weddings or other similar ceremonies. If you have the opportunity to enjoy sake with a real wood masu, the masu itself alters the taste of sake and it also alters the fragrance. It can strongly influence the experience of enjoying the sake but it doesn’t necessarily ruin the flavours. Personally, as I have written before, I prefer a pewter choko but I also like Kiriko chokos. Kiriko is a type of Japanese cut glass. An expensive Kiriko choko can sell for 30,000 yen each! Kiriko itself is all hand cut glass and when you look at the bottom of the glass, it will cause a kaleidoscope effect if it was created correctly. 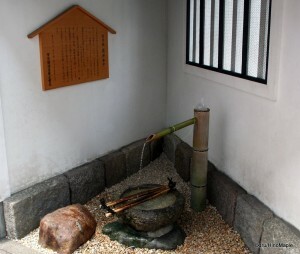 One of a few wells in Saijo. Lastly, we must consider the region where sake was brewed as each region has its own type of sake. When I visited Kobe, one of the people helping me with the tasting mentioned that the water is the most important aspect of sake. The rice is secondary when comparing it to the water as breweries can ship rice from other areas of Japan. This reasoning is even stronger in other traditional regions as even the breweries in Saijo, Hiroshima were talking about the pH balance and mineral mix of their water in order to distinguish their sake compared to other regions. While water is very important, we cannot discount rice as it is almost equally important. A good crop of rice can create good sake but like any other crop and a bad crop can negatively affect the sake. While rice can be shipped throughout Japan, most breweries will traditionally use locally grown rice. Using locally sourced rice helps to reduce costs as well as strengthen the argument that water is more important as the rice will also get water and minerals from the same regions, although if the water is deep underground this reasoning may not hold. In the unlikely event that the rice was terrible in one region, it is still possible to save the region’s annual production by importing rice from other regions, but I suspect that this is not common and used as an emergency measure. This leads us to the technique used to make sake. Technique is very important as you can’t just cook some rice, slap some yeast on it, and then put it into water to make sake. You have to have the proper technique and monitor the process closely. While most breweries in Japan will adhere to techniques that are almost the same, altering the process in a slight way will still create a difference in flavour. The time you must wait from depositing the yeast on the rice to the time you massage it is something that takes a lot of skill and experience. Watching various documentaries on how they make sake has lead me to have a great appreciation into the techniques as well as to understand why they consider sake to be closer to wine than beer, even if the technique is fermenting and brewing rather than only fermenting. Sake is a very complex drink that has been around for centuries. Often translated as rice wine, sake shares the intricate complexities of wine. There are many factors to consider when learning about how to enjoy sake but the simple answer is that sake can be enjoyed by anyone and everyone. You don’t need a lot of education to enjoy sake. Going to a restaurant and ordering whatever sake you see on the menu is not a bad thing. Everyone needs to get started somewhere but as long as you know the basic types of sake you will be able to enjoy it easily. One important tip is that many good restaurants will tell you the “level” of the sake. Positive numbers are generally sweeter and negative numbers are drier. If you are coming to Japan, sake at convenience stores is not terrible but they are generally not great. Avoid anything that says “One Cup Sake” or other types of sake that are placed in single serving glass jars. Look for dark coloured bottles that come in either 300mL or 700mL (rough sizes) as they are standard bottles. Your best bet for sake at your home or hotel is to go to a department store and look for sake that is roughly 2000-3000 yen. I hope this helps you get started with sake. This entry was posted in Culture, Food and tagged alcohol, choko, Chugoku, Daiginjo, Ginjo, hinoki, Hiroshima, Honjozo, Hyogo, japan, Japanese cypress, Junmai, Junmaidaiginjo, Junmaiginjo, kansai, kiriko, Kobe, masu, Nada, nihonshu, Oishinbo, Saijo, sakazuki, sake, wine by Dru. Bookmark the permalink. This post is better than Wikipedia. Thanks! Niigata? The best? I don’t think so. Saijo is. 😉 Being as complex and varied as wine, it is very difficult to choose the best. I do enjoy the complexities of the various types available. This was an excellent read. It covers a wide spectrum of points that could be talked about in great depth. The idea of region having an impact on sake is one we have become interested in recently. Through all of our travels (as we discussed when we went out for dinner to Devil Craft) we have noticed subtle changes to food and drink to suit the palates of the people in those areas. This however leads to these items having an identity of their own. For instance we noticed most Japanese beer paired well with food, was softer on the most part and was very easy drinking. This makes perfect sense when viewed from the perspective that drinking and eating go hand in hand in Japan. Bringing it back to your point here ingredients, especially water, have a huge impact on fermented beverages. The grains and water used can really impart a sense of place, known as terroir in wine. This is becoming a larger topic in the world of beer as more brewers try and only use local ingredients to make their products. Sake producers can show beer brewers a thing or two in this regard. Long story short this was a great post and we really enjoyed it! We actually will be organizing a sake tasting here in NY for Beer Loves Company soon. We wish you could make it in person but we know you will be there in spirit. Keep putting in the great work. Glad you liked it. I hope to someday try the great stuff you two are producing over there and compare it to the beers here. Thanks to you two, I have been on a craft beer binge and continue to try different ones whenever I travel in Japan.